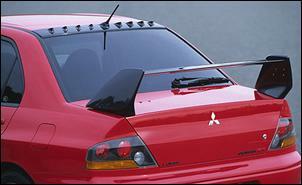 Vortex generators are now being used on a variety of high performance cars, with the best known being the latest Mitsubishi Evo Lancer. Because the same approach can be used on other cars, let’s take a detailed look at how the vortex generators on the Evo were developed, how they work and what their benefits are. As with many booted sedans, on the Lancer the airflow tends to separate form the body at the trailing end of the roof. In other words, the streamline doesn’t stick to the body in the roof/rear window transition but instead tends to leave at this point. The result is a larger wake of disturbed air and a lack of pressure recovery on the rear window. (If you’re lost, see last week’s article at Blowing the Vortex, Part 1). This separation is in part caused by the thickness of the boundary layer which increases in depth as you move towards the rear of the vehicle. A thick boundary layer means – by definition – that the airflow is no longer moving across the surface of the vehicle at the airspeed at which the car is travelling. 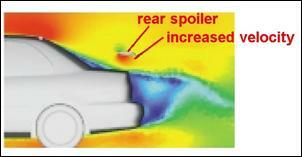 In other words, the airflow close to the car has lost its flow energy. However, if vortex generators are placed just ahead of the separation point, they can be used to put airspeed back into the boundary layer. The boundary layer then becomes energises and as a result, the airflow is more likely to stick to the body. 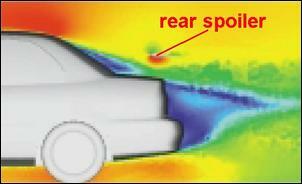 This diagram shows the flow velocities at different points on the roof/rear window transition of a sedan. The longer the arrow, the faster the airspeed. 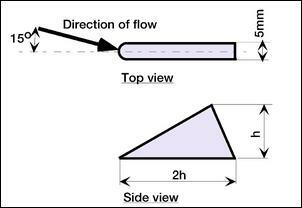 The direction of the arrows show the direction of the airflow. At ‘A’, which is ahead of the rear window on the roof, the air speed is slowest near the roof and then increases in speed as you move upwards and away from the roof. At ‘B’, which is at the beginning of the rear window, you can see that the speed of airflow at the surface of the car is zero. This is indicative of the thickening boundary layer. At ‘C’, which is part way down the rear window, you can see that the airflow on the body is actually heading in the opposite direction to the airflow past the car! The flow has separated. 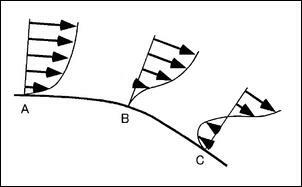 However, if a vortex generator is placed ahead of the point of separation, energy is put into the otherwise slow-moving boundary layer, as can be seen by the longer velocity arrows closer to the body surface. Furthermore, the airflow keeps going in the right direction! If as a result of the presence of the vortex generators the wake is reduced in size, or increased in pressure, or if there is increased pressure acting on vertical or angled rear surfaces, drag will be reduced. However, the vortex generators themselves will develop some drag so the end result is the balance of the decreased car body drag minus the increased vortex generators’ drag. Mitsubishi did extensive testing of the Evo vortex generators in their full-sized wind tunnel. The test speed was 180 km/h. As described, it’s possible for the vortex generators – even when functioning correctly – to add an excessive amount of drag by their very presence. A rule of thumb is that the height of the vortex generators should therefore not be much greater than the thickness of the boundary layer. 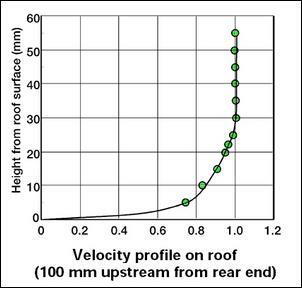 This diagram shows the velocity profile measured 100mm upstream of the rear window. As can be seen, at a height of about 3mm above the roof, the air is moving at 0.6 times (or 60 per cent) of the forward speed of the car, by 10mm above the roof the airspeed is about 85 per cent of the speed of the car, and by the time a height of 30mm is reached, the airflow is 100 per cent of the speed of the car. This indicates that at this roof position, the boundary layer is about 30mm thick. The vortex generators on the roof of the Lancer were placed immediately upstream of the flow separation point, a position which was 100mm ahead of the rear window (although this appears to have changed on the production model). Two completely different designs of vortex generators were trialled by Mitsubishi. The first was a bump-shaped device that looked a bit like an upside-down spoon. 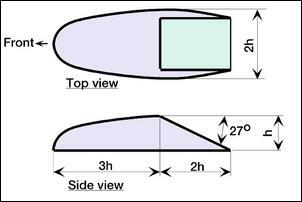 However, at the rear of the ‘spoon’ a flat surface was placed with a rear slope angle of 25 – 30 degrees. The other design was modelled on an aircraft’s delta wing (although it looks more like a wedge doorstop than a wing). Note how the shape is not mounted in-line with the airflow but instead at a 15 degree angle to it – this means that the airflow direction must be carefully mapped right across the roof if the vortex generators are to be angled correctly. So, how well did these shapes work on the roof of the Evo Lancer? This graph shows the test results for the bump shaped vortex generators. Three different height vortex generating bumps were tested – 15mm, 20mm and 25mm. Looking firstly at the change in drag coefficient (delta Cd), it can be seen that the 15mm high bumps caused a decrease in overall drag of about 0.001 and the 20mm and 25mm bumps a decrease of about 0.003. Changes in coefficient of lift showed that the higher the bumps, the greater reduction in the coefficient of lift to a maximum of a 0.005 decrease for the 30mm bumps. This graph shows the test results of the delta shaped vortex generators. The tested height of these vortex generators were again 15, 20 and 25mm. The test results showed a similar decrease in drag and lift coefficients of 0.006 for 15 and 20mm delta vortex generators. For 25mm high deltas the drag decrease remained much the same but the coefficient of lift decreased by 0.007. The delta-shaped vortex generators therefore gave clearly better results than the bumps. However, Mitsubishi do not quote drag or lift coefficients for the car, so assessing the percentage changes are difficult. If a drag coefficient of 0.35 is assumed, the drag reduction with the delta-shaped vortex generators is only 1.7 per cent. That is an important figure to keep in mind when later in this series we look at fuel consumption improvement claims made by sellers of aftermarket vortex generators! Mitsubishi performed a number of other tests to see the effect of the vortex generators. These included computational fluid dynamics (CFD) simulations and actual pressure measurements on the surface of the vehicle body. This shows the CFD-calculated velocities of the airflow without the vortex generators, modelled along the centreline of the car. From slowest to fastest air speeds, the colours are: dark blue, light blue, green, yellow, red. With the vortex generators fitted, it can be seen that the calculated velocity past the rear wing is increased. The measured pressure distribution on the boot lid is an even clearer indication of the positive changes. From lowest to highest pressures the colours are: dark blue, light blue, green, yellow, red. The greater area of red (high pressure) can be clearly seen on the boot lid and the rear window. However, note the lower pressure (dark blue) behind the vortex generators themselves, indicative of the drag being created by their presence. 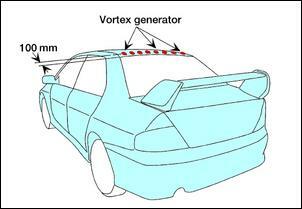 (1) Vortex generators (VGs) were installed immediately upstream of the flow separation point in order to control separation of airflow above the sedan’s rear window and improve the aerodynamic characteristics. It was found that the optimum height of the VGs is almost equivalent to the thickness of the boundary layer (15 to 25 mm) and the optimum method of placement is to arrange them in a row in the lateral direction 100 mm upstream of the roof-end at intervals of 100 mm. 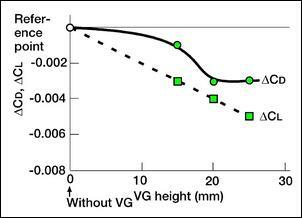 The VGs are not highly sensitive to these parameters and their optimum value ranges are wide. 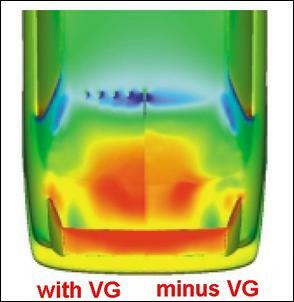 Better effects are obtained from delta-wing-shaped VGs than from bump-shaped VGs. 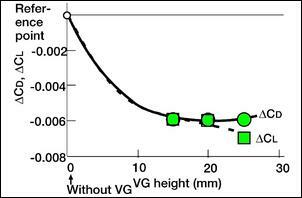 (2) Application of the VGs of the optimum shape showed a 0.006 reduction in both the drag coefficient and lift coefficient of the Mitsubishi Lancer Evolution. 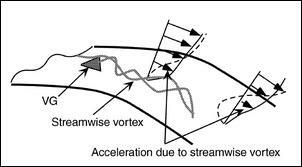 (3) It is confirmed that VGs create streamwise vortices, the vortices mix higher and lower layers of boundary layer and the mixture causes the flow separation point to shift downstream, consequently the separation region is narrowed. From this, we could predict that VGs cause the pressure of the vehicle’s entire rear surface to increase therefore decreasing drag, also the velocity around the rear spoiler to increase, and the lift to decrease. Reference: Masaru Koike,Tsunehisa Nagayoshi & Naoki Hamamoto; Research On Aerodynamic Drag Reduction By Vortex Generators, Mitsubishi Motors Technical Review, 2004, No 16.